Learn how to incorporate the Vampire Facial™, microneedling, medical grade chemical peels and dermaplaning into powerful combination treatments delivering incredible results. Describe the indications and contraindications for various peel ingredients and their application for various skin types and skin conditions. Describe the application process for all advanced peel categories. Prescribe appropriate combination therapy treatment protocols for various skin types and conditions. Perform treatments that effectively combine exfoliation, peel application and microneedling infusions. Now Includes the Vampire Facial™! Microneedling has long been one of the most effective treatment modalities available to induce collagen production and stimulate overall dermal rejuvenation. 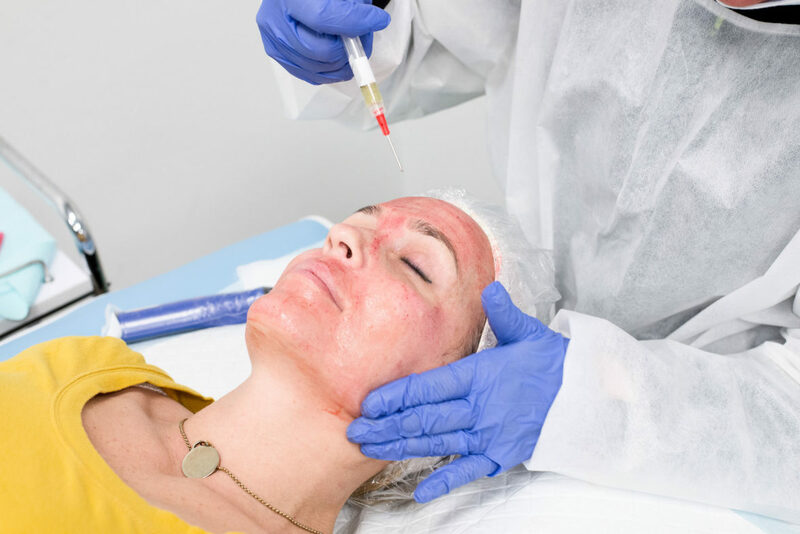 When combined with PRP (Platelet Rich Plasma) and medical grade chemical peels, your clients will experience drastic and long-lasting results. Platelet rich plasma has been found to be one of the most effective tools for regenerating the body’s own growth and healing processes. The Vampire Facial™ is the process of isolating the platelets found in the patient’s own plasma and microneedling the plasma into their skin. This treatment boosts the bodies natural skin renewal. Microneedling and peel combination therapies deliver excellent improvement in texture, tone, tightness and pigmentation. This course teaches you to layer pre-exfoliation, dermal needling and medical grade peels found in high-end medical spas and physicians offices, into a single treatment. Dermaplaning is also included in this course, which is a technique that uses physical exfoliation to remove excess hair, dead skin and superficial pigmentation. This treatment leaves skin softer, smoother and radiant. Plus, in this NIMA course, you will learn how to incorporate cryotherapy into each dermaplaning treatment to add a deeper level of rejuvenation and blemish control. Microneedling has long been one of the most effective treatment modalities available to induce collagen production and stimulate overall dermal rejuvenation. When combined with medical grade chemical peels, your clients will experience drastic and long-lasting results. Microneedling and peel combination therapies deliver excellent improvement in texture, tone, tightness and pigmentation. This course teaches you to layer pre-exfoliation, dermal needling and medical grade peels found in high-end medical spas and physicians offices, into a single treatment. Dermaplaning is also included in this course, which is a technique that uses physical exfoliation to remove excess hair, dead skin and superficial pigmentation. This treatment leaves skin softer, smoother and radiant. Plus, in this NIMA course, you will learn how to incorporate cryotherapy into each dermaplaning treatment to add a deeper level of rejuvenation and blemish control. NIMA provides medical supervision for this advanced procedure. Participants in this course must have previous education in chemical peel application. They must have a foundational understanding of peel ingredients and application protocols. This course is appropriate for those licenses that are approved within their state to provide these services. Common licenses include ME, RN, PA, APRN, MD, DO. NIMA recommends that you check with your state to determine the licenses necessary within your area of practice. Shauna has 10 years of experience in the aesthetics industry. She realized that not only does she absolutely love this industry, but also had a passion for the education side of it. One of her favorite things about the industry is that it is always evolving, and we are always learning more and more about how to provide the best outcomes for our clients. She had the amazing opportunity to teach the 750 course as well as the State Board Prep course at NIMA for two years. She now is currently a Master Esthetician at Elase Med Spa. She is passionate about helping clients feel happy with their skin, whether they are trying to slow down the aging process, treating acne, or working towards correction. She is thrilled to have the opportunity to be back at NIMA and help amazing esthetician’s gain more training and knowledge, and provide the best treatments possible. Advanced exfoliation treatments are the key to younger and healthier looking skin. Dermatologists will love having an esthetician on staff who knows how to do advanced microneedling, chemical peels, dermaplaning, etc. The knowledge learned in this course is a must if you want to work in a medical spa. This course is huge for your resume and will bring in substantial clientele. You will learn multiple techniques of advanced exfoliation that will give your clients the results they’re looking for. Plastic surgeons love having estheticians on their staff. With your knowledge of advanced exfoliation treatments, you will be extremely valuable to their practice and help bring in new clientele. Brief description of Sample Career 1, what makes it attractive, maybe what areas it’s blooming in. Paint a picture so potential students can look at this and say, “Ah, that’s my dream job.” No more than 35 words.